Ormond Williams was appointed to the JLSC in accordance with section 105(1)(a). Mr. Ormond A. Williams holds an MBA with Merit from the University of Liverpool, UK and is a Fellow of the Institute of Financial Services, UK, a Fellow of the Chartered Management Institute, UK and a Fellow of the Caribbean Banking and Finance Institutes. His banking career spans over 34 years with 21 of these years with Barclays Bank Plc where he worked in St. Vincent and the Grenadines, Barbados, Belize and the United Kingdom. He was Executive Vice President of CNB from 2002 – 2003 before taking on the responsibilities of President in September 2003 until November 2018. 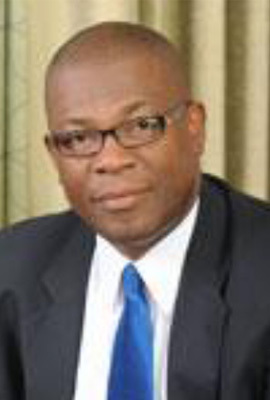 Mr. Williams is an Accredited Lay Preacher in the Methodist Church in the Caribbean and the Americas (MCCA) and Lay Pastor in the United Church in the Cayman Islands. Mr. Williams has served and continues to serve on a number of local boards. He is currently the Chairman of the Board of Governors of the Cayman Prep and High School (CPHS) and Deputy Chairman of the Board of Trustees of the International College of the Cayman Islands (ICCI). He has been appointed as Chairman from 1 August 2015 - 31 July 2019.